A collaboration between Western’s Faculty of Law and the Department of Earth Sciences is laying the groundwork for a new initiative, unique at a Canadian university. The Mining Law, Finance and Sustainability program involves an interdisciplinary approach to the field, and brings together academics, industry leaders, innovators and regulators to teach law students and graduate students in Law, Business, and Earth Sciences. The program includes: a Mining Finance Speaker Series; an Extractive and Indigenous Perspectives Moot Competition; a Graduate Diploma in Mining Law, Finance and Sustainability; Deans’ Certification Programs in Sustainability in Law and in Earth Sciences; as well as various collaborative research initiatives. The Speaker series, supported by a gift from resource financier Stephen Dattels (’72), is structured around the procurement of financing for the various production cycles of a mine, including exploration, evaluation (feasibility studies), construction (risk analysis), production, continuing obligations (environmental and social responsibility), as well as the digitization of mining (which impacts everything from shareholder spread to physical operations). The series kicked off with a talk by Jon Wylie, President, Global Natural Resources for Proudfoot. Wylie presented a detailed case study of the development of Rio Tinto's Oyu Tolgoi mine in Mongolia. He explored various angles ranging from the importance of managerial buy-in for purposes of changing mining culture and the formation of sustainable, safe mining practices, to the intricacies of raising funding in capital markets. 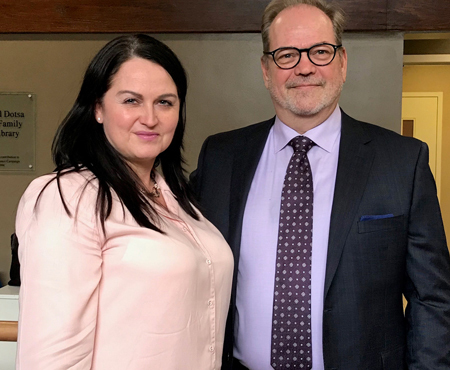 “This program is going to set new standards in industry-university collaboration,” says Elizabeth Steyn, who is co-director of the Mining Law, Finance and Sustainability program along with Professor David Good from Western’s Department of Earth Sciences. “We called on industry leaders to help us bridge the perceived gap between university and the extractive industry, and the response has been just incredible,” she says. 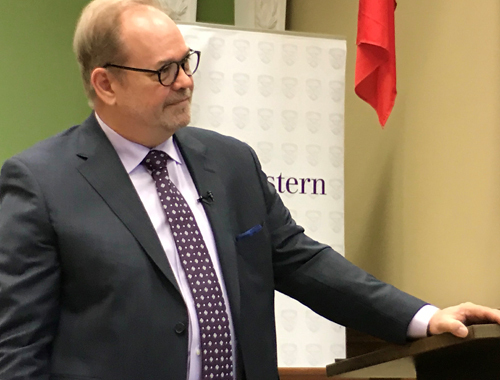 Steyn, who is the Cassels Brock Fellow in Mining & Finance Law, says the objective with the Speaker Series is to expose Western students to the realities of industry and the marketplace. “We’re privileged to work in close collaboration with industry leaders such as Proudfoot, and we appreciate senior executives taking the time to engage with our students. There really is no substitute for the kind of learning that such a classroom encounter offers,” Steyn says. Dean Erika Chamberlain expressed her thanks to the generous donors who have made these programs possible, including Dattels, Cassels Brock LLP, and Yamana Gold Inc. “There are so many Western Law graduates who have built careers around the extractive industries, and we are grateful that they are helping to educate the next generation of legal and industry professionals,” Chamberlain said. Other speakers in the series will include: Gordana Slepcev, COO of Anaconda Mining; Ricardo Valls, President of Valls Geoconsultant; Marc Leduc, EVP US Operations, Equinox Gold; Janice Zinck, President, CIM and Director, Green Mining Research, Natural Resources Canada; Andy Reynolds, Reynolds Mining Systems Integration; Beatriz Orrantia, Global Business Executive, and Former VP, Special Projects, Barrick; Nneoma Nwogu, Senior Counsel, World Bank Group; Prof. Samuel Frimpong, Missouri University of Science & Technology; Jeff Geipel, Engineers Without Borders Canada; Prof. Kalowatie Deonandan, University of Saskatchewan; and Steve de Jong, CEO of VRify and Chairman of Integra Holdings.